The Jarkiholi brothers are said to be upset about the alleged meddling by Major Irrigation Minister D K Shivakumar in Belagavi politics. 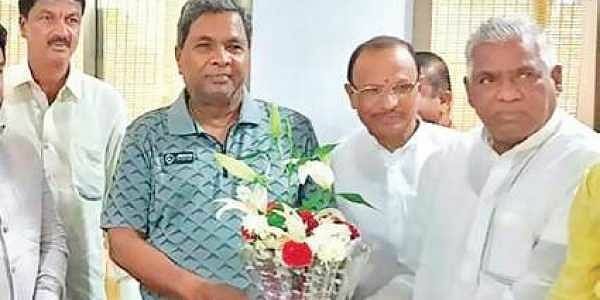 BELAGAVI/BENGALURU: The trouble that erupted within the Congress over the PLD Bank election in Belagavi does not seem to be over yet and the crisis precipitated by the miffed Jarkiholi brothers could take a decisive turn on the return of former Chief Minister Siddaramaiah from his Europe tour. “There are few issues still unresolved and only Siddaramaiah can resolve them. Siddaramaiah is our leader and we will discuss with him all the issues once he returns,” Municipal Administration minister Ramesh Jarkiholi asserted in Bengaluru on Monday evening amid a buzz in political circles about a plot to bring down the Congress-JD(S) coalition government. Ramesh, however, tried to play down the crisis and denied reports of his quitting Congress. “I will not quit Congress and there is no question of me and my brother Satish Jarkiholi joining BJP,” he said. But, sources close to the Jarkiholi camp claim that a countdown has begun for the collapse of the coalition government with a team of eight Congress MLAs headed by Ramesh arriving in Bengaluru for a final round of meeting. Sources also said the MLAs met with some top BJP leaders at Satara in Maharashtra a few days back. “The coalition government is set to fall before the 11-day Ganesha festival comes to an end. A large number of Jarkiholi’s supporters are expected to gather in Bengaluru in the next two days,” a source close to the Jarkiholi family claimed. Prior to the meeting in Satara, two rounds of meetings were held between Jarkiholis and a team of state BJP leaders, the source said. Rejecting the speculations, a Congress leader said the Belagavi issue is sorted for now. “Ramesh can’t continue to threaten the party with a show of strength. Even if he leaves the party, he doesn’t have the support of more than 2-3 MLAs. He quitting the party is only a speculation,” a party source said. The Jarkiholi brothers are said to be upset about the alleged meddling by Major Irrigation Minister D K Shivakumar in Belagavi politics. In the elections to PLD Bank in Belagavi, the brothers suffered a setback when candidates put up by Belagavi Rural MLA Laxmi Hebbalkar, a confidante of Shivakumar, were elected unanimously after a last-minute truce brokered by the Congress leadership.